The Block Fort: Why Nintendo will outlive us all. A blog for the love of Nintendo. 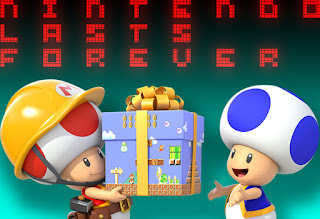 Why Nintendo will outlive us all. It's 1997. It's 6 am. A full hour before I even need to wake up to get to school on time, and even though my peers are probably still enjoying their final precious winks, I'm wide awake. Why? Because I'm not 11 year old Dan Caporello anymore. I'm Fox McCloud, piloting my Arwing through Corneria. Sweat beading on my forehead. Every hit shaking my skinny arms thanks to my new Rumble Pak. This was me almost 20 years ago, and over all these years, one thing has not changed. Nintendo still makes the best video games of all time. And yet, doomsday prophecies surround Nintendo. Analysts, fan-boys, and journalists have been predicting the demise of the big N since the N64 days. We all think we know the direction Nintendo should go in, be it going mobile, ditching hardware, or just making the games we think they should make. Everyone has an opinion. And this is part of the reason I believe Nintendo will survive, and thrive, for a long long time. We all care about Nintendo, like we care about our own families. We love her, even if we don't always agree with her, or follow her. If something happens, we want to know that Nintendo is going to be ok. That's because Nintendo has secured itself the most powerful cast of IPs you could dream of. If you've ever played Zelda, Pikmin, Kirby or StarFox, those experiences are burned into your memory. How does Nintendo do it? That makes their games stand out so profoundly from the competition? If you've ever looked at a Nintendo game and asked yourself "why would they do that?" You've discovered Nintendo's secret weapon. Creativity. Call it a gimmick, call it genius, but surprise is one of the most memorable emotions humans can experience. And even if Nintendo tries something and falls, at least they caught your attention on the way. with, it had too few games, it gave kids headaches etc... And even though Nintendo technically lost money and time by releasing it, the long play of the Virtual Boy is amazing. Today, the Virtual Boy is touted as one of the most unique and sought after pieces of hardware for collectors and Nintendo fans alike. And if you've ever seen the reaction of a kid trying the Virtual Boy for the first time, it's priceless. They hardly know what to do with it. It's a mystery. And it gets people talking. Sorry for the gif party. But your reaction says it all. Nintendo is the king of retro gaming. If you disagree, I'll see you in the comments section below. This is part of what keeps Nintendo alive. Say what you will about the Virtual Console, I get into why it's great in another blog post. But Nintendo's game library holds up over 30 years, which is quite an accomplishment. How do they do this? Nintendo has always been, and will forever be, THE place for family friendly gaming. They perpetuate couch co-op when the rest of the world is pushing online. They almost never publish a game above an E-10 rating. They make the most affordable hardware. They know how to make games that are easy to play but difficult to master. While the rest of the world is concerned with making things as edgy as possible, Nintendo is perfectly content to make Splatoon. year your super edgy game will look dated because something NEWER and EDGIER has come out. That isn't an issue when you're designing games for kids because what's good for kids today, will be good for kids forever. Super Mario Maker is a perfect example of this theory in action. Not only that, but when you make games for the whole family you end up with the most loyal fanbase in history. We've been playing Nintendo games our entire lives. And if you grow up and have kids, guess what they're going to play? Nintendo. Will they grow up and play something other than Nintendo? Probably, but whenever a new Mario Kart comes out, they'll perk up again. Here's the wrench in my theory. Nintendo still needs to make money, and you don't do that by failing. I'm glad that they're willing to take risks and try new things, because someone has to, but I also want Nintendo to be successful. So far Nintendo has been able to stay afloat, and even turn a profit, thanks to clever usage of their IPs with Amiibo, and pushing out consistent, quality software on the Wii U and 3DS. They're a smart company, but they're risk takers. The future of Nintendo is never certain. If you've been a Nintendo fan for any amount of time, you know that you can never really predict what's coming around the corner. An Animal Crossing party game? A Mario level builder? How about a 3-player online Zelda dungeon crawler? It might not always be what you wanted, but it'll always be unexpected. And the combination of familiarity and surprise will keep the lights on at Nintendo for a long time yet. What do you think? Is Nintendo about to kick the bucket? Let me know your thoughts in the comments below. I'd love to chat with you! Yoshi Kong Adventure: The game that never existed. Why Disney might be interested in buying Nintendo. The New Dad Gamer: So you want to keep your hobby? What if Apple owned Nintendo?